You can install and use the core SQLite library on the official download page, but as a .NET developer your best bet is go with System.Data.SQLite – an ADO.NET provider for the SQLite engine. It also includes design-time support in Visual Studio 2005/2008! SQLite is a single-file based database which is useful for testing and for embedding in applications. This means that all the information is stored in a single file on a file system and you use a SQLite library to open this file to read and write your data. Here you can browser select, insert as you wish. It is easy to use and uncomplicated. SQLite Administrator is a great little freeware tool supporting multiple languages and many features. 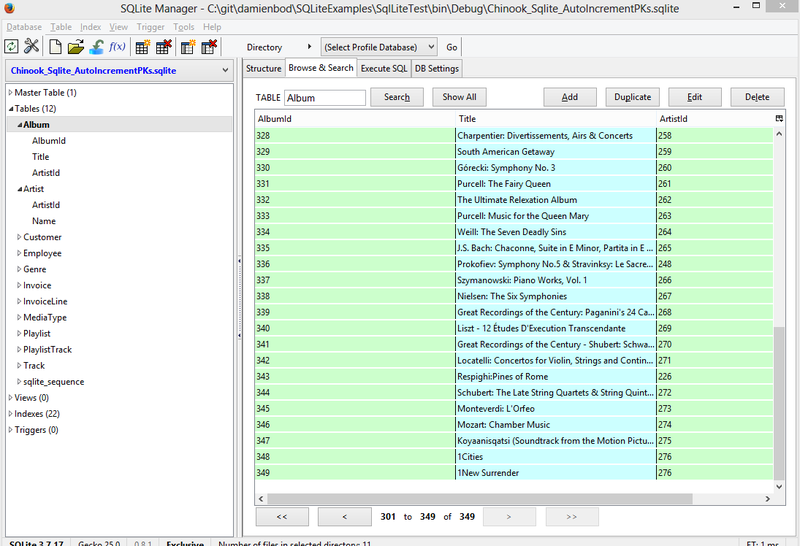 sqlite-net available from this link https://github.com/praeclarum/sqlite-net. Unfortunately, the getting started documentation are not enough. It doesnt even mention how to create a database. I tried looking at the examples, unfortunately, the examples are broken(unable to compile, run time error etc). Unfortunately, sqlite-net doesnt fully support sqlite.org sqlite implementation, thus making the tutorial useless for praeclarum sqlite-net. This entry was posted on 22 agosto 2014 a 2:04 pm	and is filed under .NET, DataAccess. Etiquetado: sqlite. You can follow any responses to this entry through the RSS 2.0 feed. You can leave a response, o trackback from your own site.